Odd. Barry doesn't "look" French. I didn't even think about my tangent detracting from your work. I just saw the "rhetorical blindfold" as an allegory for the TOTUS. Wicked sharp. 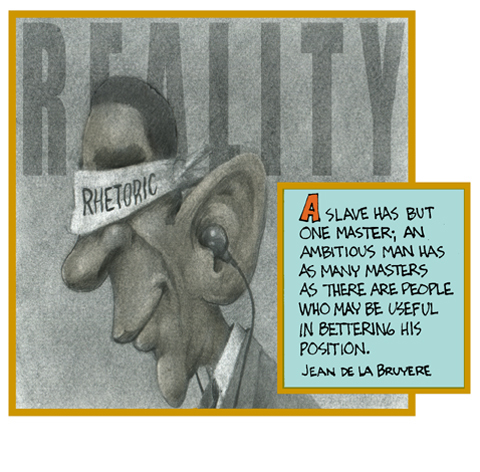 Ok, it's a rhetorical blindfold made from his own telepromptered words. Blinded from reality by his own words. Though some your "distractions" tend to leave me in the dust, gasping for air as if I'd been bludgeoned with an OED, I enjoy your participation. Thanks for the kind word. I like to that my work inspires The Introspective. This page contains a single entry from the blog posted on December 28, 2011 5:45 PM. The next post in this blog is Happy Birthday, Doc!.